Lochrin Bain launch new products. New Technical Support Service for PSSA Members. Thames water extends Zaun contract. Anti-terror product manufacturer celebrates a second award WIN this year. 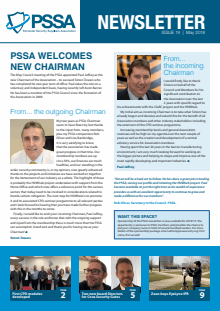 New chairman for the PSSA. Security & Counter Terror Expo. 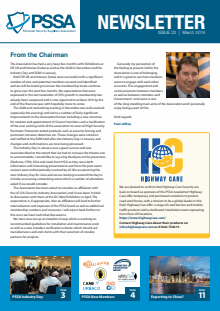 Security high on the agenda for ports and shippers. PSSA part of the National Security “Big Picture”. Avon Barriers introduce ballistic protection against armed attack. ArmaWeave Plus secures new data centre. New Subs Scales for 2015/16. 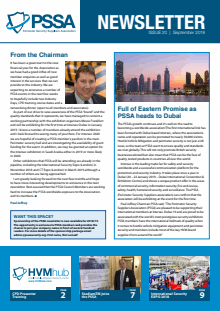 PSSA to partner with Security & Counter Terror Expo. PSSA teams up with the NSCC. PSSA Technical Support Service gets off to a flying start. Rooftop MUGA for space age Salford MediaCityUK school. 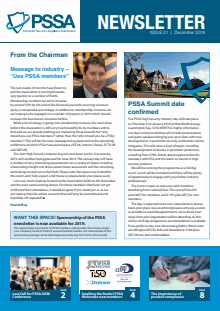 2015 set to be ‘the year of the PSSA’! Cova Security Gates continuing to invest in their work force. Successful test for new Heald HT1 Mantis 80 Array. Verification Scheme Progress and Credibility Boosted. Ardenleigh reopens for troubled teenagers. Frontier Pitts – Meeting the Challenge. PSSA Members Approve New Policy. Frontier Pitts Launch the Terra Hubble Bollard. PSSA Council Elects New Vice Chairs. Skills for Security calls on Industry Practitioners for Assistance (P2). Another World First from Heald. PSSA hold AGM at the London Chamber of Commerce. PSSA Verification Scheme Press Release. Interview with Chairman Laurence Goode. Bavak Security Group Launch New Speedgate.